Amidst the Mass Effect 2 excitement yesterday, another little title was released that for the most part, we feel will just go unnoticed. 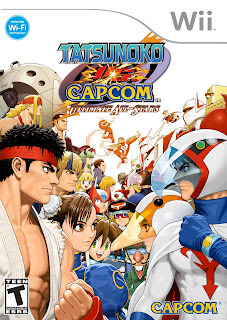 So that's why we feel it important to educate your brains so you can start warming up your thumbs in preparation for Capcom's Tatsunoko VS. Capcom: Ultimate All-Stars is now available at a local retailer (or online e-tailer) of your choice. A Wii-exclusive, you can pick it up for only $49.99, and it's rated "T". If you're a fan of fighting games, and love the Capcom brand (who doesn't), walk, don't run (it's dangerous, and lets face it, that'd be a LONG run), so you can soon be playing with the likes of legendary Capcom characters, Ryu and Chun-Li, Frank West, and even MegaMan. If you even know what Tatsunoko is, then you'll recognize such characters as Ken the Eagle and Jun the Swan. We hope to have a review up soon of our play-time with the game, in the meantime, let us know what YOU think!